1989 was a breakthrough season for Mike Dean and the Saints. 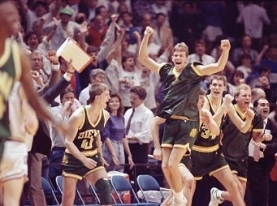 One year earlier Siena won 23 games, the most since the 1951-52 season. 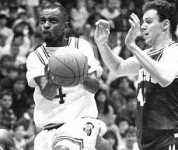 Expectations were high for Deane and the Saints heading into the 1988-89 season. After a loss to Bowling Green to open the season, the Saints upset Pittsburgh, which would go on to finish fourth in the Big East. 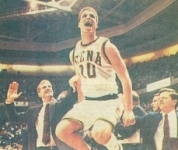 Siena dominated the North Atlantic Conference. They finished 16-1, won the NAC Tournament and advanced to the NCAA Tournament. The Saints earned a No. 14 seed in the East region and faced Stanford. Behind a game-high 32 points from Marc Brown, Siena stunned the Cardinal 80-78.